Fodder is food for domesticated livestock, whether for cows, pigs or horses -- but not all livestock food is fodder. It’s not a word typically used by horse owners as a general descriptor of what they feed their horses. Fodder has characteristics that distinguish it from other types of horse food. When you grow food specifically to give to your horse, you are, technically, growing fodder for them. The key is that it is given to them; if a horse goes and grazes on a 2-acre pasture, he's not eating fodder. If, however, you grow grass for hay, cut it, bale it and feed it to your horse, you are producing and giving him fodder. You can grow and harvest food for more than one species; for example, corn can be grown as fodder for other livestock as well as horses. 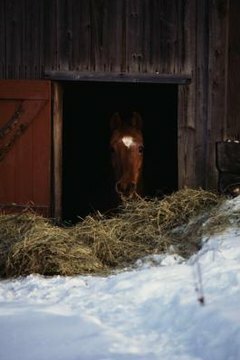 Several types of fodder are familiar to horse owners. Popular cereal grains include oats, barley and flaxseed. Other foods are not so common; in European countries, for example, horse owners commonly feed fruits and vegetables. Fodder beets were commonly grown for working horses in Germany until prolific soil contamination became a widespread concern. In the United States and elsewhere, sugar beets are commonly grown for the dual purpose of both human food and horse fodder -- the pulp produced during manufacturing is dried and sold for horses. Silage is another means of utilizing crops grown for livestock fodder. The crops are cut when the moisture content is ideal for fermentation to occur during storage. The resulting silage can be used year-round or used to supplement forage in the winter or during hay shortages. Often silage crops are grown to help remove high concentrations of nutrients in the soil and then stored to use as fodder later. The fermentation process makes silage dangerous for horses, though, because of the potential for mold toxins to develop. Horses are very sensitive to mold compared with other livestock, and can get sick and even die from eating food contaminated by it. Hydroponic fodder is food that is grown with water and nutrients but no soil. It’s an ideal growing system for land-challenged horse owners who want to feed their horses fresh fodder with nominal cost and labor. You can grow all of the cereal grains horses commonly eat: barley, alfalfa, oats, grass, wheat and clover. Despite those advantages, however, you need to be diligent about monitoring the fodder for mold because of the high-moisture environment inherent in the hydroponic method. Kentucky Equine Research Equinews: You Feed Your Horse What? Agriculture and Agri-Food Canada: What Is Hydroponics?